Нашел видео заряженного ЖТР Р35. От американских тюнеров. The American tuners Hennessey, who made a name for themselves turbo charging Dodge Vipers, are now the proud owners of the world’s fastest Nissan GT-R. 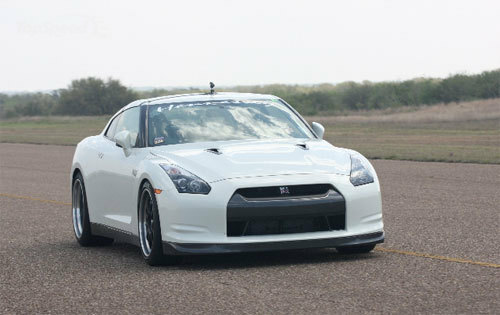 This past March at the Texas Mile, Hennessey drove their 700 HP GT-R through the traps at 193.7 MPH. Owners of Nissan’s Super car can purchase the Godzilla 700 kit for $18,500, or $24,500 installed. а как насчёт комплектации Super-V, как ни как а плюс 80 коней, я про GT-R.
80 лс 8 секунд отставания при разгоне 0-300 не сократят :) Это я к тому, что пока что не знаю ниодного ЖТР, который как-то побил бы Вейрон.